The boys are thrown into jail on the prison planet Takron-Galtos. Jon is separated from Damien and put into solitary confinement, so that his powers may fade. Damien spends much time searching for him, and comes across Rex Luthor, who is attempting to assemble a new "Gang". After a face off with the Gang, Jon comes to Damien's aid, having found a way to recharge. Story - 5: This month's issue picks up the pace again, after having a lull last issue. Though mainly a Damien centric issue, it was fun to see Jon take a page from the Nuclear Man from Superman IV, and use what little sunlight he could get to recharge, leading to the awesome last page of him busting through a wall, much like his father has done many a time. Damien using his skills, to find Jon, and protect other prisoners from Rex in his search was a welcome return to his loner roots. I loved the narration by him, as he swings from roof top to roof top, getting the lay of the land, and also learning the language. I had said before, that I never was a fan of Damien, but it was the way Tomasi wrote him, that made me quite fond of the character. Tomasi has worked magic with Damien, along with Jon, and made them great contemporary staples, of the DCU. The highlight of the issue for me was Damien's never say quit attitude, and then when all seems lost for him, Jon comes to the rescue. This is a wonderful example of the modern age World's Finest. 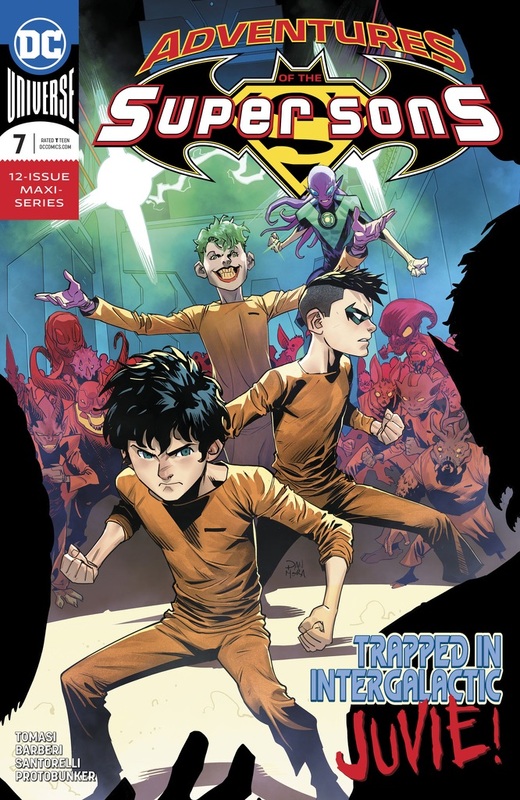 The mantle seems to have been passed to the Super Sons, and with Tomasi's help, they are running with it. It's just a shame that this series only has five issues left before it wraps up, but let's enjoy the ride as long as we have it. Art - 5: Carlo Barberi never ceases to amaze me with the way he renders these characters. He injects such energy into each page, bringing it to life in his Anime influenced style. It doesn't just stop there; he seems to borrow some classic tricks from legendary artists of the past. The scene of Robin swinging away from Kid Sinestro, looks like it came straight off of Todd McFarlane's drawing board, and a couple of the shots of him swinging and landing look heavily influenced by Jim Lee. However my favorite still has to be the last page splash, where Jon busts down the wall, coming to Damien's rescue. I know that the "red eyes of anger" is a sore spot for some fans, and I have always held to the fact that, when utilized properly, they can be an effective tool in storytelling, and I feel here is a great enough example. Jon isn't angry, but does show that he has had enough of the current situation! What more can I say about Protobunker's colors, other than, without them, the art would look flat and somewhat lifeless. Cover Art - 5: Dan Mora's cover this month is as exceptional as the art inside. Damien and Jon fending off a horde of alien prisoners, with a Joker in the background! Instant classic cover.